my home cooking and everything i can think of...: Unsatisfied with Coke in PET Bottles! 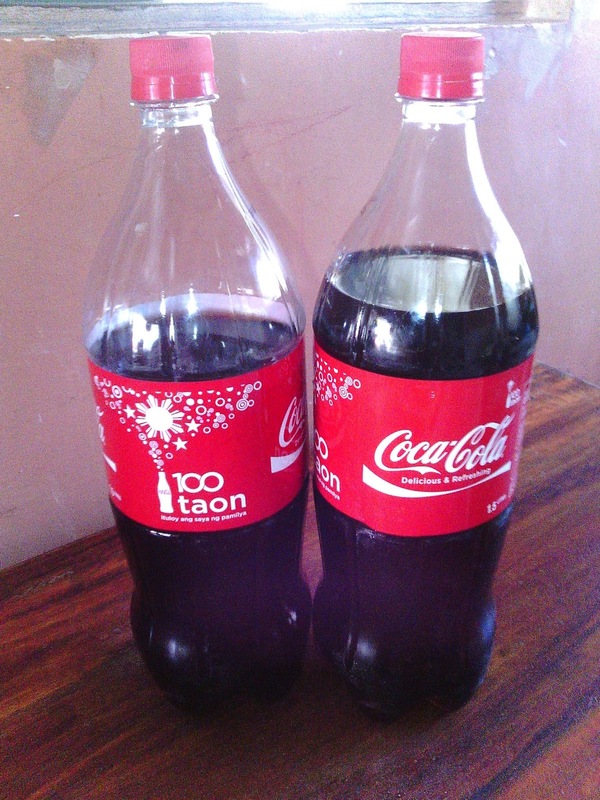 Unsatisfied with Coke in PET Bottles! On February 10, 2013, Barangay Iponan in Cagayan de Oro celebrated the feast of San Guillermo (St. William the Hermit). It was also the birthday of Ethan, our eldest son. As our tradition, we celebrated it with a dinner with family and relatives. A day before that, I bought 3 - 1.5 liters Coke (in PET bottles) in one of their mobile stall (plastic table with a big red umbrella) beside Westfield Subdivision at 3 for 130 pesos with a free coke glass. I thought Coke people were selling it at a discounted price as part of their promotional activities considering it was “fiesta” here. Regular price at stores near our place sells it at 45 pesos. Happy with the bargain, I was ecstatic to tell to my wife with what I had bought. To my dismay, when I opened it to serve it to my guests, ONLY ONE was GOOD with enough carbonation and the rest had stale taste. I felt being robbed by coke. If I had bought it in a regular store, I could have returned it and perhaps asked for a replacement but since I got it in their promo stall, they were already gone the next day. I could have squeezed the bottle first. If it is too springy, carbon dioxide must have already escaped from the PET bottle making it stale. I should have looked at the expiry date first because the two that got wasted were due to expire on February 26, 2013. They must have bargained it because it was nearing its best before date. And lastly, I should have stocked to the usual coke in glass bottles. It tasted better than in their PET counterpart, plus, I am helping save the environment by reducing plastic wastes. Awww! It was indeed a waste of money Kuys. Better to buy it at the authorized retails stores na lang and we should be careful with the expiration date... Sayang jud!